Rich Martin Homes > Selling Your Heights Area House > House Inspections – What to Expect? House Inspections – What to Expect? You have successfully negotiated the offer on your house and have a contract. What now? Note: This post is 1 of 8 on the house selling process. See them all on my House Selling Page. Once your house is under contract, you are close to closing, but still a ways to go and pitfalls to avoid. “Expect the best, but prepare for the worst” definitely applies here. Being aware of the pitfalls is critical. You are going to have inspectors stomping in, around, above and under (if pier & beam) your house for several hours. Sometimes just a mechanical/structural guy, and a termite inspector, but others may join them. The buyers will be there too. Expect the unexpected. Your Central A/C may be problem free, but refuses to come on at inspections. Don’t ask me how, but things break just before inspections. Toilets won’t shut off, windows leak after a gusty storm, the garbage disposal refuses to turn; doors start sticking. They worked fine before, but not now. Frustrating, unexplainable, but just deal with it. · Termites. I was at an inspection (representing the seller) when termites swarmed out of the house during the pest/termite inspection! It was amazing; hundreds of the little buggers came out of this tiny hole in the sheetrock in the bath. Single file, one after the other. The timing could not have been worse. It didn’t help that the buyer’s Realtor ran from the house waving his arms shouting “termites”. You would think it was the Invasion of the Body Snatchers, all the hysterics. It still worked out. 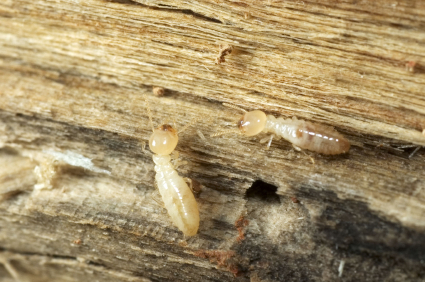 The seller paid to treat the termites (they were subterranean termites, easily & cheaply eliminated by treating the soil). You may have termites and not know it until the inspector points it out. · Foundation problems. These are common too. Houses settle and move. If it’s a slab house and has settled too much a corner of the house (or more) may have to be lifted. If the inspector says it has moved excessively, extend the option period and have someone else look at it. Again, no big deal. A failed slab is one thing, but differential settlement is common and easily resolved. Pier & beam houses are easier yet. Jack’em up and put in shims. Relatively cheap. · Roof Repairs. This is probably the most common big ticket item behind CAH. Inspectors are paid to point out problems and potential problem. Any old roof is a potential problem. The inspector can’t say whether a roof will leak or not. All he can do is estimate life left on the roof. If he thinks it only has a couple years left, of course he is going to recommend replacing it. The homeowner won’t be happy… “It hasn’t leaked, why should I put on a new roof?” This is a big expense, so of course neither party wants to pay for it. Remember, the buyer is nervous; he may be putting every penny he has into down payment, closing costs, etc. He may worry about having a big repair item right after moving in. Some agreement canalways be worked out. · Collapsed sewer lines. Pressure testing old cast iron or clay sewer lines is common. Leaking lines may also cause foundation problems, so it’s something buyers look for. The items above are major, and are the ones the lender is concerned about. The will not loan on a house that has termites, or a failed slab. The roof is iffy. So, if there are major problems with above components expect to repair them before closing, or escrow the money for the buyer to repair. The lender may dictate how this is to be done. Heating and cooling systems get scrutiny too, of course. These are big ticket items so the inspector looks at closely. If he has doubts, he will recommend an A/C service man look at it. All house inspections will find issues. New houses aren’t perfect and may have little repairs needed. Older homes have lots of items for no other reason than changing codes. The two-wire electrical may still work fine, but some electronics and appliances must have a grounded 3-wire system. Plumbing issues, electrical and GFCI issues, sticking doors and windows, water heater pressure valve, improper furnace venting, improper roof bracing, yard drainage issues, rotted trim boards. The list goes on-and-on. These are common and to be expected. If the buyer and their Realtor are sharp, they will ask for just critical items. They may get greedy (or nervous) though and ask for too much. Compromise by offering to repair the safety related items, or a repair allowance that they can use any way they want. End result of house inspections? The buyer is emotional, and is trying to deal with questions and potential problems he knows little about. Try to come to an agreement to take care of the real issues (Mainly safety items and major systems) and to allay the fears of the buyers. As the seller, you will be nervous too. End of option period. Never play brinkmanship. Resolve issues quickly where possible. If the option period is ending and there are still unresolved issues; extend the period. People don’t make rational decisions when under a time limit. They make emotional decisions, which are never good. Give them (and yourself) time to think and come up with solutions. That’s it! There is a lot more stuff, but people will only read so much. Click here to see my next article: After the Option Period-What Next? It covers the final steps of loan approval, title work and appraisal. See several more article on House Selling. Subscribe to my blog to get updates.